This tutorial is the same which ever Operating System you are using. Hi Wilmap, you've done dome great stuff here well done. Any chance you could re-do the Zip File tutorial for Windows 10 please. Thanks. TYVM :) I am new to Daz & I am currently taking online classes to re-educate my self due to a accident that left me physically disabled, I plan on reading ALL of ur tutorials they look very simple to use for a NEWbie like my self. I have not seen any NEW post here. I hope that you still respond :). I may have some questions for you as i read ur tutorials :).. have a good day.. n tyvm again. I sent you a reply to your e-mail. Yes they will all work in DS4.7 If you have installed everything correctly you should find items under Genesis/G2F or G2M/Clothing/Pusey Designs/name of item. They should also appear in Smart content under Wardrobe. Having followed the instruction I still can not find the items. Do these files work with DAZ studio 4.7? I know how to ownload and unzip files into DAZ but I can't find the beret. 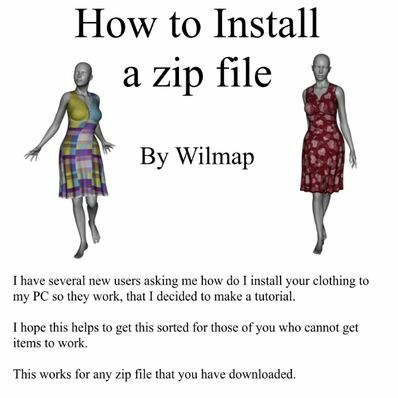 Hello, I know how to download zip products but after I dont know what to do with it? I mean how and where to install it in my daz library? Have a great day!